All you have to do is go to town with some paint and about a million coffee filters! It doesn’t get much easier than this! T and A were going through a period of preschooler angst at the time (that was a difficult month or two to live through, as they’re normally best buds), so I intentionally only put out ONE paint pot of red and ONE of blue – with only two brushes and NO water for rinsing between color changes. 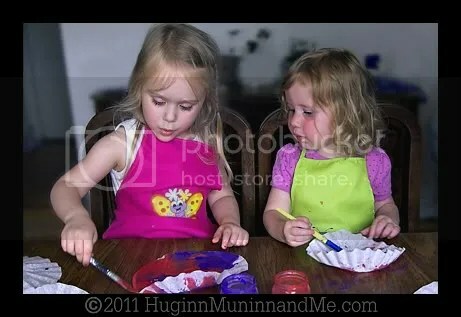 After I sternly threatened warned them that craft time would come to an abrupt halt if I even heard the slightest hint of a squabble, they were forced to politely ask and wait their turns as each finished using their current color. They did beautifully, and for a blissful moment, all was well (they have since resolved their differences, and play nicely together again – for the most part). Try to convince the kids to leave a bit of white on each filter (they prolly won’t, though), and sprinkle glitter ‘stars’ before the paint dries if you wish (we always want glitter)! 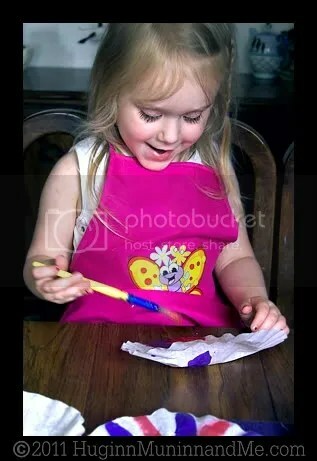 Once the paint is dry, give the kiddo’s some scissors (depending on their age and ability) and have them cut the edges of their filters just a bit. When you’re done you’ll have made a fat fringe around the outside, but still have a solid center. Then take 3 or so of your pretty coffee filters (add an all-white one if you wish), poke a hole through the center of each one, and ‘tie’ them all together with pipe cleaners to make a firework flower! You can leave each flower separate, if you wish, or bunch several together like we did to make a huge bouquet. The girls had a fantastic time making these, and we made tons extra so they could destroy a few running around the house and using them as pom-poms and still have enough extra to put on display. So EASY-PEASY! And the girls were so proud of their beautiful bouquets! Before I forget, I have to post about the FLAG COOKIES! I stumbled across them on Laura Flower’s blog called The Cooking Photographer (obviously her cookie pictures are waaaaay nicer than the ones I almost forgot to take). She calls them Berry Raspberry Icebox Cookies, and I am copying her fantastic recipe here so that I can find it again next year! 1. Line an 8×4-inch loaf pan with waxed paper, extending paper over sides of pan. 5. Divide the doughs in half again to make 6 layers. Pat a red dough into the wax paper lined pan. Press gently with the back of a dry measuring cup to even out the dough. Next, pat the plain dough between your hands to form nearly the size of the pan. Press the plain dough into the pan over the red layer. Repeat with blue, red, white and blue. 9. Remove dough from pan and trim edges. Cut log into ¼” thick slices. Then cut slices in half to form squares. This is a fun recipe that kids really can have a great time helping with – plus they’re TASTY! The first batch we made just as instructed, and they were delicious! (Hint: if kids are helping, put the dough, food dye, and Jello into a large Ziploc bag. They can squish it all together through the plastic, and hands stay clean :)) This recipe is great for littles, because they get to have the fun of mixing the dough and coloring it, then a break to run the wiggles out while the whole thing is chilling for the next stage. Then a friend of mine tried it . 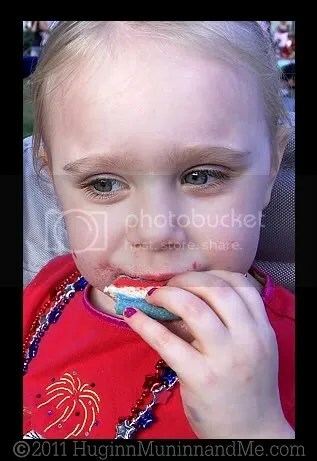 . . she misread the instructions, added the entire packet of Jello, and still got good results. So the second time I added twice as much, and they were so yummy! 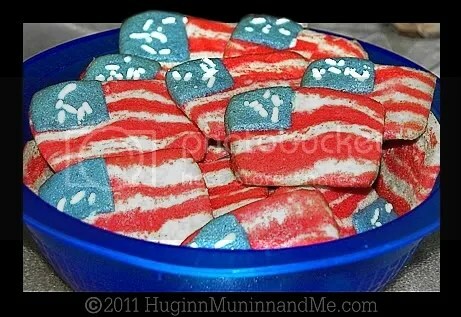 T was napping this time around, and I lost my mind and decided they’d be way tastier if they actually looked like flags! I am not a huge fan of sugar cookies OR Jello, but the combination was so good that I can’t wait to try making them again with other yummy jello flavors mixed in! Love those firework flowers!! 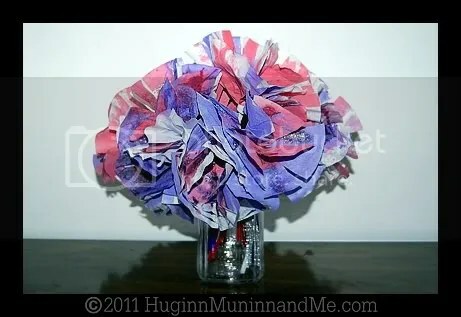 I MUST try those sometime, I bet the girls would love to decorate the house with random colored coffee filter flowers. 😀 So pretty!! Heehee, you totally turned your self in! I mentioned no names, and who said anything about WASTING??! I saved the extras for the next round, and still have some waiting to be used! I figure as long as it’s kept in an air-tight container, it ought to keep for a while, neh? The exp. date on jello powder is like 3 hundred years. 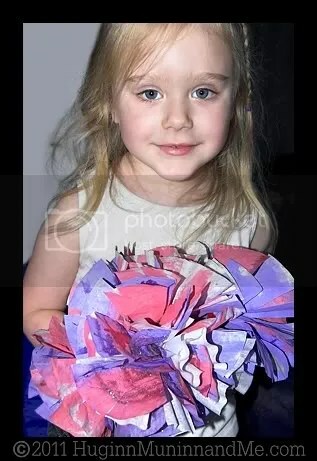 . .
And yes, we often paint coffee filter ‘flowers,’ all the girls really love it! A fun thing to do along the same lines is to use medicine droppers with a water and food coloring mix. The colors bleed and spread so prettily. Another tip? Soak those dried out markers in water overnight, and save the ‘dye’ from the markers for projects like this one 🙂 It works perfectly! I’m totally going to figure out how to make a Christmas tree with the filter ‘poms’ this year! i have an idea for the Christmas trees that will probably work well. i get to you with it next week, we’re leaving for the oshun, hon, tommorrow. love you all! Can’t wait to hear your idea for trees! Maybe you can come over and craft them with us! OR we can go there and make them with you! Though you prolly don’t want my kids running around your house with paint. Ha. Your cookies are amazing-looking. Wish I could eat a few of them right now. T looks so pretty with her flower bouquet. I need one of those cookies. Yummy. SERIOUSLY. . . I swear to you, they are SO EASY it will make you laugh! You aren’t even actually DOING anything – it’s all mixes! Try it. I promise you’ll rock it. How can you not be a fan of either sugar cookies or jello? That’s like saying you’re not a fan of goodness. I am a fan of chocolate. Chocolate is condensed looooooooooove, baby. First, the cookies look beautiful and delicious! A lovely combination. Next, the flowers are so fun for the kiddos-we love this craft around here. Now, in reference to your comment today about slapping yourself, which made me SMILE, I tend to be slapping myself a lot lately to remind myself of what is truly important. Have a great weekend!!!! Those flag cookies were -damn- good!